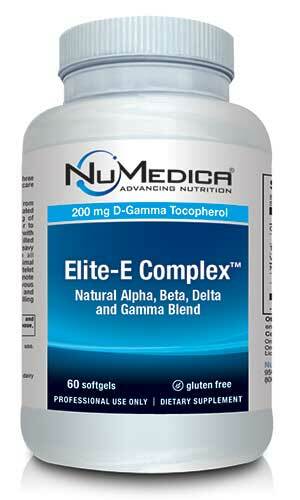 Vitamin E to support the immune system and provide essential antioxidant protection. NuMedica Elite-E Complex is a superb blend of Alpha, Beta, Delta, and High Gamma, all forms of vitamin E known as tocopherols. Research demonstrates that vitamin E has a significant antioxidant effect that provides protection for various organ systems like neurological, cardiovascular, reproductive, ocular, and skin health. Tocopherols, more popularly known as vitamin E, are found in both natural and synthetic forms. A fat-soluble antioxidant, Vitamin E provides protection for cell membranes by reducing the damage that free radicals cause. As you may be aware, free radicals are associated with aging and the onset of various illness and health conditions anything from arthritis to cancers to heart disease. An optimum level of vitamin E reduces the damage that free radicals can do the body. According to scientists, vitamin E is also required to support various muscles in the body as well as the heart. Because vitamin E also assists in the formation of vital red blood cells, it's important that we incorporate this vitamin into our diet either through natural sources or in supplement form such as NuMedica Elite-E Complex. Vitamin E is found in food sources such as grains, nuts, eggs, meats, fruits, and vegetable oils. Leafy green vegetables are a great source of vitamin E as well as some types of seafood like shrimp and sardines. However, because vitamin E is so essential with its antioxidant protections and support for the body's functions that many find it important to ensure their bodies get the necessary dosage of these nutrients by taking an effective supplement. Vitamin E can provide the body with many important benefits. Studies suggest that it supports the immune system and boost the body's ability to repair DNA. It appears to support sensitive tissues like eyes, breasts, and liver as well. In fact, recent studies suggest that vitamin K could help reduce the risk of cataracts. Further research indicates that vitamin E reduces the risks for diseases like certain cancers and cardiovascular conditions. Other Ingredients: Gelatin (bovine), vegetable glycerin, soybean oil, purified water. †Beta, Gamma and Delta tocopherols do not have IU equivalents.